Yesterday I had a chat with Tyler Barnes, Senior Product Manager for Inventor Publisher at Autodesk, about a new labs project called Publish to Social for Inventor Publisher 2012. As with all Autodesk labs projects, Publish to Social is a technology preview which basically gives Inventor Publisher the ability to publish content to a couple of social media web sites – YouTube and Facebook. First off, you need to install Service Pack 1 or 2 of Inventor Publisher 2012 which you can download from here. As with all Autodesk software, service packs are free. Unlike some other CAD vendors no subscription is required. Inventor Publisher 2012 comes with the following publishing options. 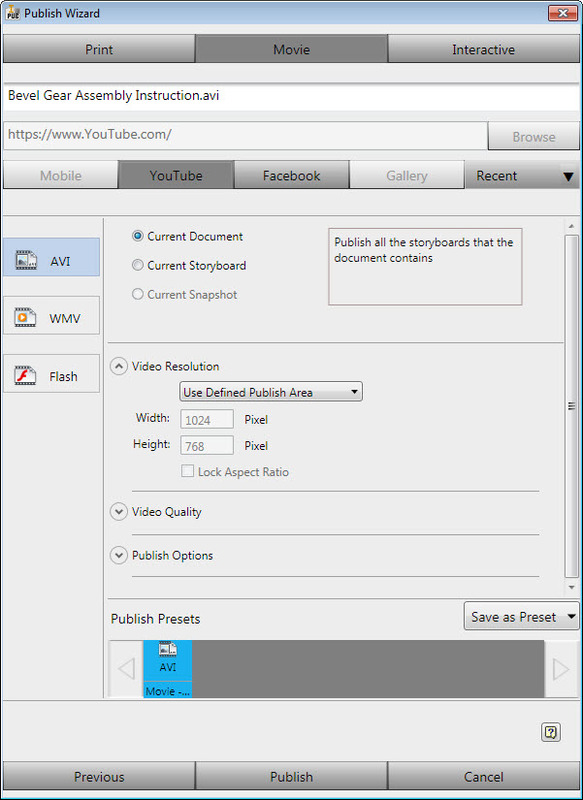 Publish To Social works as a plug-in to Inventor Publisher 2012 and adds a new publishing wizard that publishes directly to YouTube and Facebook. I assumed that it was as simple as signing into my YouTube or Facebook account in Inventor Publisher and clicking “Publish”. So I opened one of the sample files that came with Inventor Publisher 2012 and ran the wizard on it after selecting the YouTube option. Inventor Publisher did something for a while and then gave me a “not enough memory” error message. Video editing is a memory hog. So I shut down the million other applications running on my workstation and tried again. No joy. I restarted the computer and ran the wizard first thing. Still no success. Without much more to try out I started fiddling with the publishing options in the wizard. The default format for YouTube is AVI. I switched it to WMV and tried again. This time Inventor Publisher went for a long walk and returned with this message. No reason given. I switched back to AVI, adjusted the video resolution to 640×480 and tried again. Got the “not enough memory” error again. I have a pretty decent workstation, a Dell Precision M6400 with 4 GB RAM running Windows 7. And moreover, I opened a sample file from Inventor Publisher, not some large assembly with a timeline of a Hollywood movie. I had a good mind to give up but I decided to try one last time. I switch back to the WMV option and kept the video resolution to 640×480. This time Inventor went for an even longer walk and returned back with this message. I logged into my YouTube account and noticed that YouTube had started processing the video uploaded by Publish To Social. Here is the YouTube video generated and uploaded by Publish To Social. Next I tried publishing to Facebook using the default publishing options – WMV with the default video resolution. I got this. So I switched back to a video resolution of 640×480 and tried again. That didn’t work either. These two failed attempts were for the AVI video format. I couldn’t try the WMV option because the moment I selected it the Facebook option got disabled. So I guess Facebook doesn’t support videos in WMV format.